Mingo Press is a printer that has been servicing the needs of picky graphic designers and other creative professionals for more than 35 years. 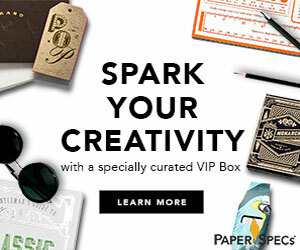 Cubic, which handles Mingo Press’ marketing, ended up becoming the inspiration for the printer’s most recent campaign, which highlights Mingo’s special ability to cure creative panic attacks. 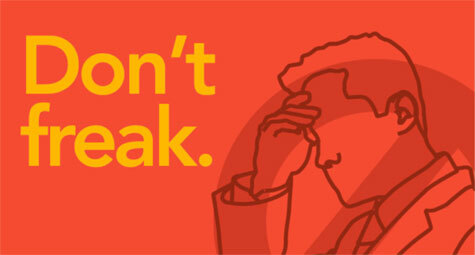 As Cubic puts it, “This campaign is based on our own very real freak-outs.” Fortunately, Mingo Press has a group of professionals with cool heads, sound printing practices, and the urgent desire to help their panicked clients. 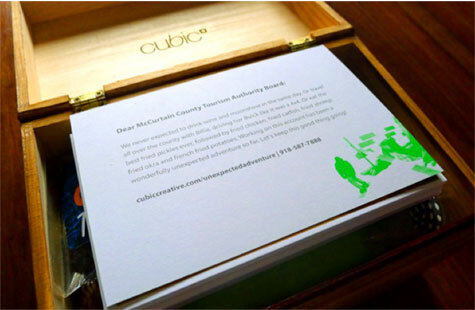 Cubic trusts and relies on Mingo Press every day. The story that follows is just one great example of how Mingo routinely cures that agency’s own creative panic attacks. Cubic picks up the tale from here. 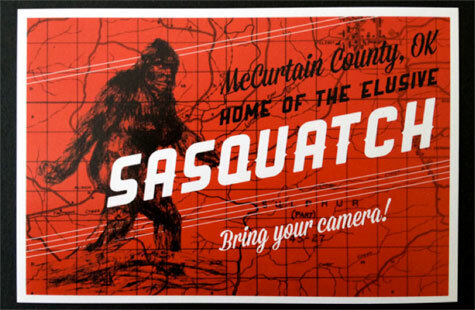 So we were pitching a tourism account in southeastern Oklahoma. We were one of three groups presenting in one day, so an inspirational leave-behind was important to stand out in the creative parade called a pitch. The only way to get down to this beautiful place is to drive. It takes every bit of 4 hours and 2 pit stops (and maybe an ice cream cone) to get there. Note that this moves our hard deadline up by half a day. McCurtain County is a little piece of paradise down in the corner of Oklahoma, shrouded in mountains, tall pines and big oak trees. The back woods are home to all kinds of critters. Legend has it that one of them is Bigfoot. In the center of it all sits Beavers Bend State Park, sporting National Park Service Rustic style cabins built in the 1930s. Today, more than 600 modern cabins are scattered throughout the woodsy county, available for rent by fishermen and families alike. We wanted to marry the nostalgia of the state park with today’s modern style, wrapping it all up together into one cohesive brand package for the county. 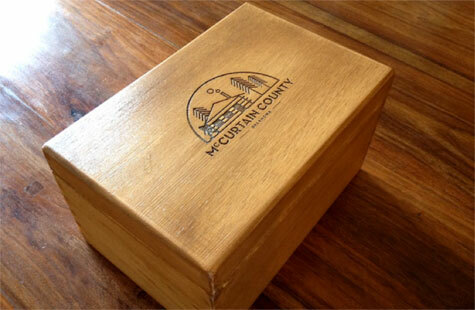 So we designed a logo and laser cut it into the top of a wooden box. Then we packed the box full of stuff designed to fit with the brand look and feel. As you’ll see, we had a lot of fun! Until it was time to print it all…that’s where Mingo came in. We made beef jerky. 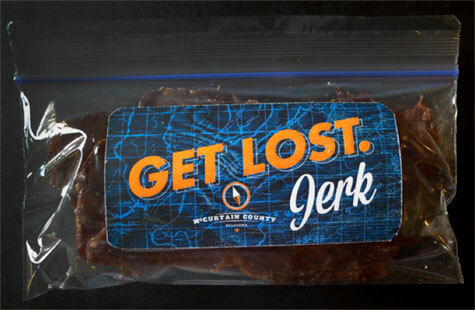 (Really – we made the jerky, and its packaging!) So much fun. We made postcards. A whole set of them. We wanted to put these in the cabins with stamps already on them, ready for visitors to mail to friends and family. What better direct-mail program is there than that? Mingo printed the pitch postcards for us in digital full-color. They looked and felt like the real thing. We wrote McCurtain County a love note. Mingo printed it for us. Fast. 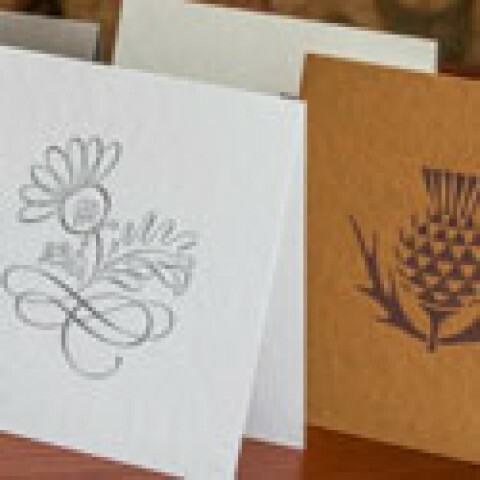 On awesome paper. The deadline approached. We still needed another wow. The pitch was just 24 hours away. They said, “We’ve never done it but we think so.” Remember the can-do attitude? 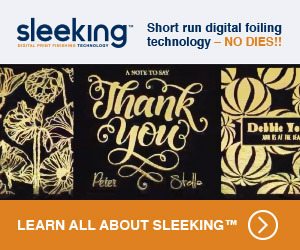 Mingo has an 8-color, wide-format, flat-bed press that prints on rigid substrates that normally won’t absorb ink. They had printed on acrylic and metal but never cork. But they were willing to give it a shot. 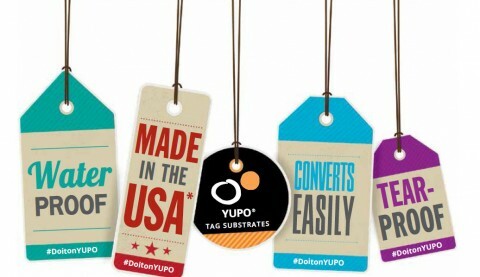 Mingo prints full-color digital, offset and spot-color with thermography and a variety of coatings. 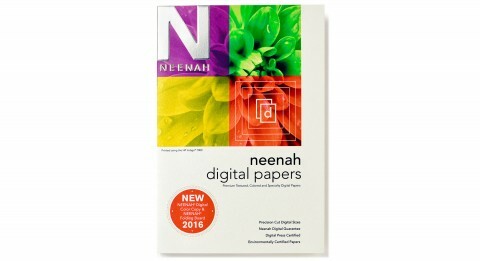 They keep several high-quality papers from Neenah and Cougar in their floor stock, but routinely print on French, Mohawk and other papers beloved by designers. 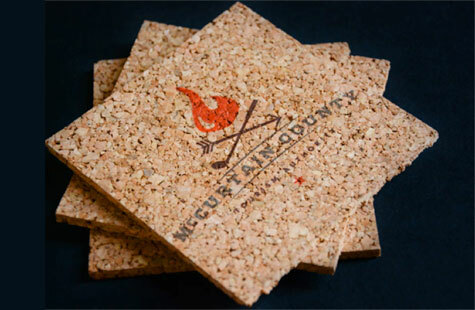 And occasionally, cork. So when we write a line that says they have developed a cure for creative emergencies, we mean it! 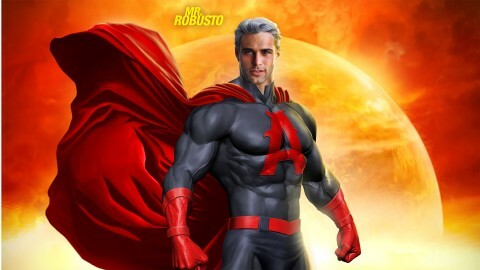 To see the campaign that came out of this idea, click the links below. 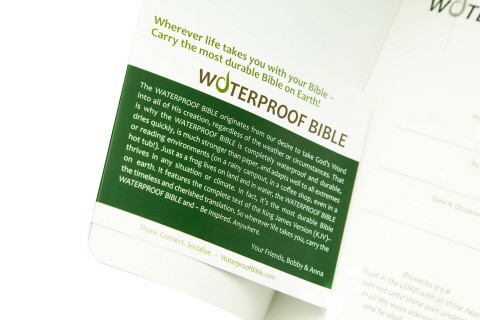 And of course to place an order, visit them online at mingopress.com. We promise you won’t be sorry. And our clients loved the postcards. Mingo then printed 5,000 cards with eight different fronts on their offset press. They applied postage stamps by machine in half an hour and delivered the cards just in time. As usual! 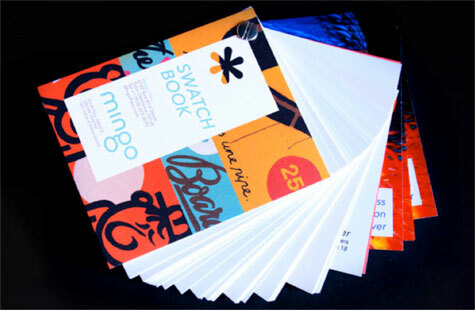 PaperSpecs readers, request your copy of Mingo Press’ Sample Kit and Swatchbook today.